Today, the Trump Administration approved harming whales and dolphins as part of the administration’s reckless, out-of-touch “drill-everywhere" plan, which seeks to do the bidding of Big Oil at the expense of coastal residents, economies, and wildlife. Seismic airgun blasting and eventual drilling is economically and environmentally unjustifiable. When the electric vehicle revolution renders Atlantic oil drilling obsolete, it won’t be possible to take back the damage done to our beloved coast. Photo by Darin Ashby via Unsplash. 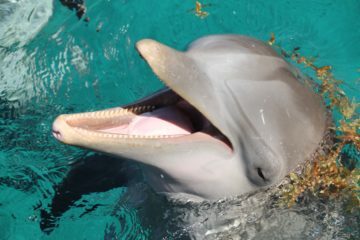 Today, the Trump Administration’s National Marine Fisheries Service approved harming some of the Atlantic’s most precious creatures, including whales and dolphins, in order to allow the oil industry to search for oil and gas with risky seismic airgun technology. Such approval came in the form of incidental harassment authorizations (IHAs), issued by the National Marine Fisheries Service, which gives legal clearance to oil and gas exploration companies to incidentally (not on purpose) “pursue,” “torment,” and “annoy” marine mammals protected under the Marine Mammal Protection Act to the point of injury, hundreds of thousands of times. The authorization is part of the Trump Administration’s “America First Offshore Energy Strategy” and overturns the Obama Administration’s 2017 decision to deny the permits. Another federal agency, BOEM, still has to issue the final permits before the surveys will be officially allowed. The issuance of these IHAs sets up marine mammals to be another casualty in the destructive path of the Trump Administration’s reckless, out-of-touch “drill-everywhere” plan, which seeks to do the bidding of Big Oil at the expense of coastal residents, economies, and wildlife. Seismic airgun blasting and eventual drilling is economically and environmentally unjustifiable. 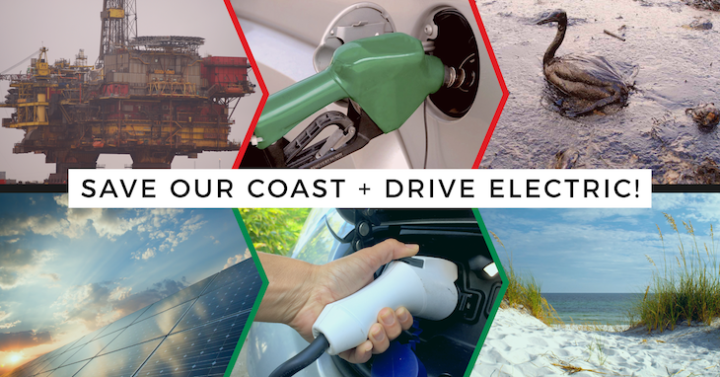 When the electric vehicle revolution renders Atlantic oil drilling obsolete, it won’t be possible to take back the damage done to our beloved coast. For example, analysis we published earlier this year showed that people purchasing just 35 million electric cars to replace conventional combustion cars would completely offset the oil that could be produced from opening all of our nation’s currently protected offshore areas–the Atlantic, Eastern Gulf, and Pacific combined. While this may sound like an ambitious goal, consider that the U.S. Energy Information Administration (EIA) estimates that nearly 15 million plug-in vehicles will be on the road by 2030 and Bloomberg New Energy Finance expects that 5 to 10 million electric vehicles will be sold each year in the U.S. from 2030 to 2035. Furthermore, a recent AAA poll of American drivers found that 50 million Americans will likely go electric for their next car. Meanwhile, the amount of oil that could be economically extracted from the Atlantic is miniscule. For example, a 2017 EIA report calculated that the Atlantic, Pacific, and Eastern Gulf offshore regions, which are currently off limits to drilling, contain just 4.9 percent of the nation’s entire technically-recoverable crude oil resource, including onshore and offshore areas. At the same time, two-thirds of the total offshore technically-recoverable crude oil off of all of the lower 48 states are located in the Central and Western Gulf–where drilling is already allowed. If drilling were to occur in the Atlantic, it would bring great risk to the existing coastal tourism economy, worth billions of dollars per year and employing hundreds of thousands of Southeast residents. With such great risks to the Southeast coast by eventual Atlantic drilling, no demonstrated need to extract Atlantic oil, and highly viable alternatives in the form of electric vehicles, it is preposterous that the Trump Administration is choosing to grant a favor to Big Oil while jeopardizing our environment and economy with the issuance of these IHAs. Offshore drilling threatens our beaches, wildlife, and coastal tourism economy. Meanwhile, electric vehicles are now affordable and widely available and could completely offset offshore oil production while also saving customers money. Please fill out the form below if you’re interested in promoting electric vehicle policies in your local communities. We’ll be in touch to work together! 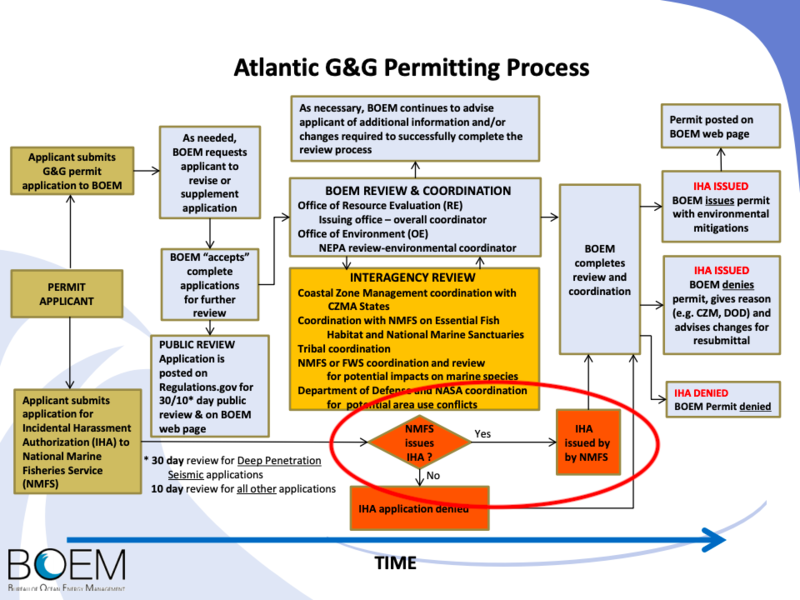 This flowchart shows the process of Atlantic seismic survey permitting. 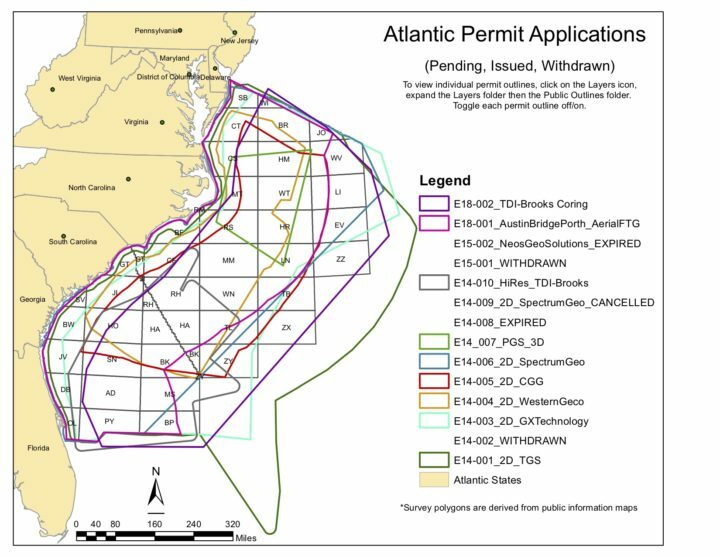 Today’s announcement is the stage circled in red, “IHA issued by NMFS.” A final permit from BOEM (Bureau of Ocean Energy Management) will still need to be issued before seismic airgun surveying can begin. Map of pending Atlantic geological and geophysical (G&G) surveys, including seismic airguns (indicated as 2D and 3D) and other technologies. The colored lines represent the outlines of the areas each company wants to survey. The five IHAs granted today were for CGG, ION GeoVentures, Spectrum Geo Inc., TGS-NOPEC, and WesternGeco. Some permits shown here are expired or cancelled.